L-Glutamine is a natural amino acid, considered "conditionally essential" by nutritionists. 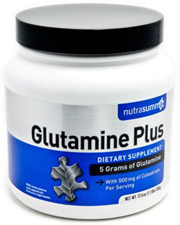 Glutamine is an amino acid your tissues use as fuel. It's the most plentiful amino acid in skeletal muscle. Your body can manufacture glutamine, but certain factors - including heavy exercise, can deplete your stores. If you exercise a lot, your body's demand for glutamine may outpace its supply and weaken your immune resistance, making supplementation a good idea. Glutamine has demonstrated its importance in a wide variety of functions in the body. It is an integral component of glutathione, a natural peptide which is one of the body's most potent antioxidants and detoxifiers. With Glutamine Plus, Nutrasumma® balances this versatile nutrient with another versatile compound, bovine colostrum. Colostrum is a natural mammalian pre-milk compound growing in respect for its support of immune function and growth factors. Ingredients: (per serving) L-Glutamine - 5,000 mg, Colostrum (from bovine pre-MILK) standardized to 18% immunoglobulins - 500 mg. No other ingredients. Suggested Use: Mix one scoop (5.6 g) daily in water or diluted juice, preferably apart from a concentrated protein, ora as directed by your health care practitioner.